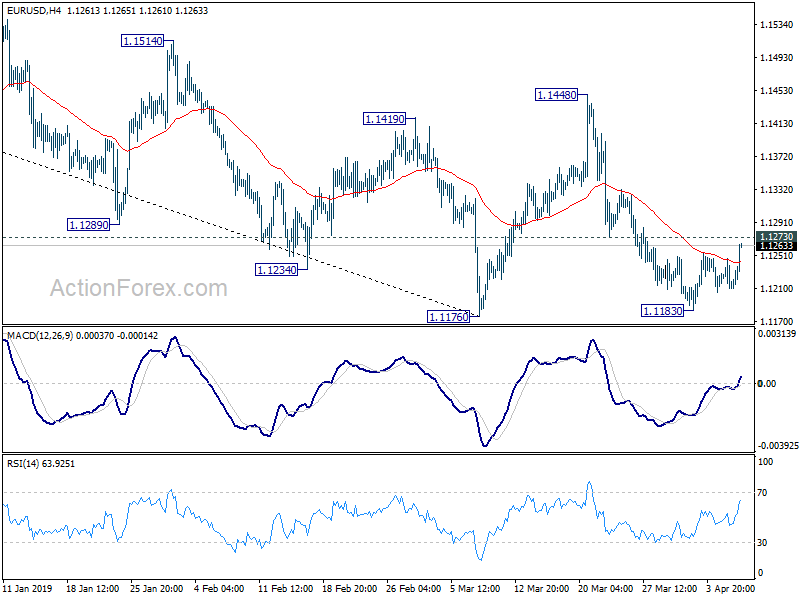 Euro receives a wave of buying in European session, partly as lifted by improving investor confidence data. 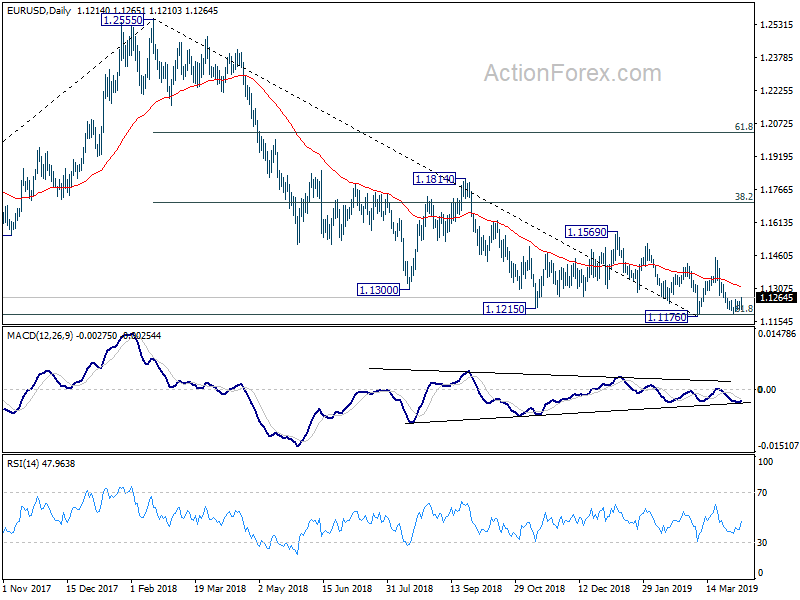 EUR/USD’s break of last week’s high is a positive development. Yet, the rally is not strong enough to warrant near term bullishness yet. Meanwhile, the common currency remains bounded in familiar range against Sterling, Yen and Aussie. More is needed to prove it’s underlying strength. Staying in the currency markets, Yen is currently the strongest one as risk markets turned mixed. There is no follow through buying in the stock markets after last week’s rally. Sterling is mixed as markets await fresh development in Brexit. For now, EU’s granting of long extension before April 12 cliff edge seems to be the base case. New Zealand Dollar is the weakest one for now, followed by Dollar and then Aussie. 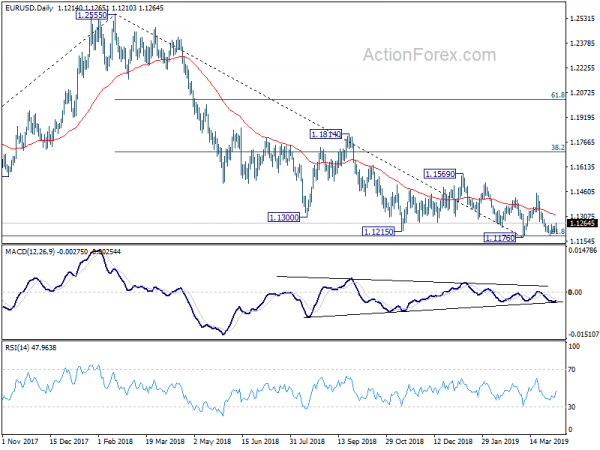 Technically, EUR/USD is now looking at 1.1273 minor resistance with today’s rise. Break will indicate short term bottoming for strong rebound back to 1.1448 resistance. USD/JPY could have a take on 111.18 minor support and bring will pave the way back to 109.71 support. In Europe, currently, FTSE is up 0.09%. DAX is down -0.25%. CAC is up 0.05%. German 10-year yield is down -0.0034 at 0.007, staying positive. Earlier in Asia, Nikkei dropped -0.21%. Hong Kong HSI rose 0.47%. China Shanghai SSE dropped -0.05%. Singapore Strait Times dropped -0.22%. Japan 10-year JGB yield dropped -0.017 to -0.046. Eurozone Sentix Investor Confidence rose to -0.3 in April, up from -2.2 and beat expectation of -2.0. That’s already the highest figure since November 2018. Expectations Index rose for the third month in a row to -4.3, highest since May 2018. However, Current situation index dropped for the eighth month to 3.8, lowest since February 2015. However, Germany’s Overall Index dropped to 2.1, lowest since August 2012. Current Situation index dropped to 10.5, sixth decline in a row and lowest since April 2010. Expectations index rose for the third month 10 -6.0, highest since March 2018. Germany is now “one of the regions with the weakest economic momentum”. “Collapse” of situation values is “worrying”. Sentix added that “it would be positive if Germany did not rely on China and the USA alone, but sought to make its own contributions to economic stabilization. Also from Eurozone, German trade surplus rose slightly to EUR 18.7B in February, below expectation of EUR 19.0B. UK Prime Minister Theresa May is scheduled to meet German Chancellor Angela Merkel and French President Emmanuel Macron tomorrow, just a day ahead of the EU summit. She’ll also hold calls with other EU leaders today. May is generally expected to try to make her case for a Brexit extension till June 30. But ahead of that, May needs to handle opposition Labour leader Jeremy Corbyn first. The two could meet against to find a compromised Brexit solution to get through the parliament. But May’s spokesman reiterated her insistence for UK to have independent trading policy after Brexit. And that is clearly in conflict with Labour’s requests for staying in the customs union. In its Regional Economic Report, BoJ J still painted a much weaker economy. On the whole, assessment on three of the nine regions – Tohoku, Hokuriku and Kyushu-Okinawa – were downgraded. BoJ also pointed to “effects of the slowdown in overseas economies on exports and production” for the changes. Only Hokkaido was upgraded thanks to dissipation of downward pressure from 2018 earthquake. Though, BoJ noted that “domestic demand had continued to show firm developments, with a virtuous cycle from income to spending operating in both the corporate and household sectors.” Business investment was not affected by the oversea slowdown and “has continued on an increasing trend, with corporate profits staying at a favorable level on the whole.”. Private consumption has been “increasing moderately”. BoJ Governor Haruhiko Kuroda maintained his view on the economy in a speech at a quarterly meeting of regional branch managers. He said Japan’s economy was expected to continue expanding moderately, even though slowdown overseas is affecting exports. But for now, BoJ will continue to expand monetary base until consumer inflation exceeds 2% target stably. And, short- and long-term interest rates will be kept at current very low levels for an extended period of time. Also from Japan, consumer confidence dropped to 40.5 in March, below expectation of 41.5. Eco watchers sentiment dropped to 44.8, missed expectation of 47.6. Current account surplus widened to JPY 1.96T in February. Daily Pivots: (S1) 1.1202; (P) 1.1223; (R1) 1.1237; More…..
EUR/USD recovers strongly today but stays below 1.1273 minor resistance. Intraday bias remains neutral first. on the upside, break of 1.1273 support turned resistance will indicate short term bottoming at 1.1183. Intraday bias will be turned back to the upside for 1.1448 resistance. On the downside, decisive break of 1.1176 will resume the down trend from 1.2555. In the bigger picture, medium term weakness was revived as the weak rebound from 1.1176 was rejected well below 55 week EMA and failed to sustain above 55 day EMA. Focus is back on 1.1176 low, with 61.8% retracement of 1.0339 (2016 low) to 1.2555 (2018 high) at 1.1186. Decisive break there will resume whole down trend from 1.2555. Such decline target 1.0339 low next. On the upside, firm break of 1.1569 resistance is needed to be the first sign of medium term bottoming. Otherwise, downside breakout will be in favor. Previous articleDAX: After Superb Week, Will Momentum Continue?